WODies are BY FAR the best piece of fitness equipment I've ever bought in all my years. After having hand surgery for a torn ligament I have tried every type of hand protection on the market due to discomfort on my scars. The grip is perfect because it glides with my movements. I find that leather always sticks to the bar and bunches and pinches. WODies lay flat on my hands and are so flexible, I can do every movement without having to take them off like leather. They just stay on the whole time. The wrist support is fantastic and I'm so glad they combine it with the hand protection so I don't have to double up. There IS a break in to them, and they can be slippery during that period, but after a few workouts with chalking them up and sweat building up, they get so nice on the bar. I find the more I use them the better they get. Wodies are the best option, nothing else even comes close and I've tried them all. Wodies are the spirit of crossfit. They are multidimensional tools to be more functional in the gym! The wrist wrap gives nice support while you're doing hand stand push ups, olympic movements, or any overhead motion where there's a lot of pressure on your wrist. The material holds a good chalking for a lot longer than using chalk on your hands would. The material is very durable and covers your palm well so ripping is an issue of the past. Your grip will fail long before your skin ever notices your on the bar or rings.I think these guys are great and priced right. To ensure a custom, secure fit, the finger holes on all WODies are cut only as small slits, allowing the user to individually cut the holes to match his or her finger size. Just be sure to consult the sizing chart below before making your order. The more accurate the glove size, the better the results. WODies are machine washable, so you can clean and re-use them repeatedly without concern of built-up bacteria or odor. Wash with like colors and tumble dry low. In summary, these grips have a combination of wrist support and palm protection to help tear through a WOD, rather than your skin. Available in four sizes, WODies are manufactured in the USA using a latex-free, hypo-allergenic elastic. 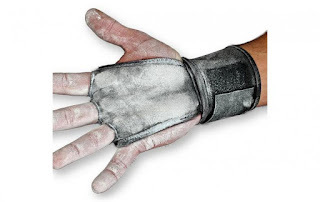 The material offers enough padding to help prevent common cuts and skin irritation on the hands, but it’s also breathable and able to absorb both sweat and chalk, improving your grip.